Every once in a while, a movie comes along that makes you feel proud to be Greek. Captain Corelli's Mandolin transports you to your grandparents' village, with breathtaking views of the ocean and mountain hillsides, presenting an authentic picture of our collective Greek heritage at one of history's darkest hours. While the cinematography, the music, and the general look and feel of the movie are excellent, the acting, accents, and story leave a lot to be desired. We must admit we had chills running down our spines throughout the opening part of the movie. From the depictions of the church services, to the panigiri afterwards, to the shouts of "ZHTO!" as the young men prepared to go to war, the first fifteen minutes of this movie evoked more emotion than any other movie we've ever seen. The news accounts of our victory over the Italians in Albania was like watching history unveiled right before our eyes. What sent both this movie and the island of Cephallonia downhill was the introduction of Captain Corelli (Nicolas Cage) and the Italians. 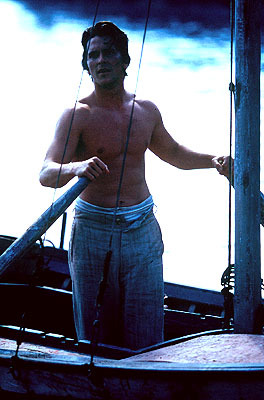 Nicolas Cage, as Captain Antonio Corelli. Don't get us wrong, the Italians added comic relief to this movie, but this movie started being more about the Italians than the Greeks. All the frolicking and the opera singing was a little too lighthearted knowing what was coming next. (Not that the wartime violence didn't make the movie much more realistic, if not a lot more bearable for the guys in the audience.) And, by the way, Nick Cage can't do an Italian accent to save his life. Strong, like her Spanish accent. The Greek characters in this movie were by far more interesting than the Italian ones. 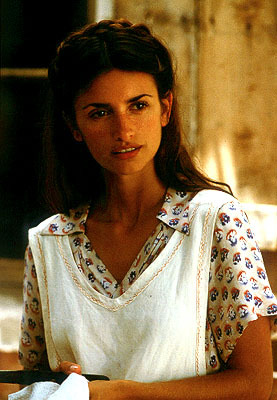 Pelagia (Penelope Cruz) at least had the Greek girl attitude down right, if not her accent. (It was better than Cage's though.) She went through the conflict that's presented to every Greek girl in history, between doing the right and expected thing and taking a risk. She had her own Penelope dilemma, while waiting for her Odysseus, in this case, Mandras, to return from the war. 1. A mind is a terrible thing to waste… Now all you Greek guys out there pay attention. We all know that Greek men are intimidated when their women are smarter or more successful than them. Mandras wouldn't have lost Pelagia if he had been smart, or smart enough to admit his shortcomings. 2. Never take a good Greek girl for granted. When a Greek girl calls you, call her back. When you go away for a weekend, or a world war, make sure to drop her a line. Never disrespect a Greek girl, in front of her friends, her family, or in front of the entire village. 3. A Greek girl will always dance with someone else to make the guy she wants jealous? Why do they always do that? 4. Greek women nag too much. That's about all we have to say about that. 5. Greek girls will fall in love with any clown with a musical instrument. This includes DJs. Ladies, if you're going to let this happen to you, at least fall in love with someone with a big bouzouki, and not a tiny mandolin. All in all, Captain Corelli's Mandolin is worth seeing simply for its views of Cephallonia, its presentation of the inhabitants of the village, and the most Greek names you will ever see in the credits of a movie. (We had often heard that you were supposed to wait through the credits of a movie, because there will always be one Greek in them, but this movie had enough Greeks for every movie this century.) A simple working knowledge of the Greek language adds to the experience of watching this movie, as you'll find yourself laughing at some of the jokes about 15 seconds before the rest of the audience. Even better would be if you could gather a few of your Greek friends to come with you, so you don't sound like the one idiot who thinks something is funny when the rest of the audience doesn't. Quite honestly, our viewing of this movie would not have been the same if not for the 30 other Greeks we had in the theater with us at the time. If your Greek isn't that good or all of your other Greek friends already saw it, then save your money and either go to a matinee, where you'll be the only one in the theater laughing, or wait for it to either come out on video or at a cinema and draft house. 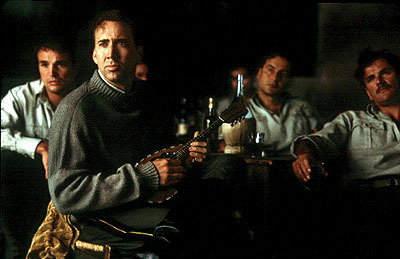 Unfortunately, judging by this weekend's poor 6th place showing, Captain Corelli's Mandolin may not be in theaters long.